Hi there. My first compost is almost a year old now. I just realized that it have not composted enough yet - do you think I can use the compost in my greenhouse? And what have happened here? It smells anaerobic. It never heated a lot up, measured temperature and turned it 5 times. Temp was never above 40 degrees Celsius. It consists of kitchen waste, weeds, straw, leaves, coffee, horse manure, old plants from greenhouse etc. look at the pictures and tell me what I have done wrong and if I can use it? Maybe it have had too little air? Also there is no lid in the bins. Maybe I can add some sawdust to make it reheat?? I think you compost is finished. The lignins will decay in time. Unless you are equipped to mechanically grind your compost, and screen it its not going to come out homogenous. Apply it to field, till or spade it in plant in two+ weeks. Did you water it? Did it get too dry? It has to be damp. Was it too wet? If you picked up a handful, could you squeeze water out. Were the bins kept full? You get better aerobic action and heat in a full bin. Was the mix 50/50, brown volume to green volume? How many weeks between tossing? I wouldn't add sawdust, which is very fine textured, and tends to compact. If you have a way to get it out of the bin (does one of those sides open? ), I would get it out in the open. Mix in some of the straw or leaves you were talking about and toss it some. It will be all right in awhile after that. JC's Garden wrote: Did you water it? Did it get too dry? It has to be damp. Hi there. Thanks for answering my question, and yes, i will talk to you. In the autumnn i layered all the greens with straw and horse manure, and watered it. It doesnt have a lid, so it have had a lot of water throughout winter here in Denmark. I have a compost thermometer, and the maximum temperature i ever measured was 40 degrees celcius only in the middle of the pile. I have turned it now and then, but after the 40 degrees, it never really heated up again. So my mix must have been wrong from the beginning. I just tried picking up a handfuld, and yes, i can squeeze drops of water out if i squeeze real hard. Yes the bin where full. I only used bin nr. 2 for turning. However after i discovered the smell, i put half in each, in order to make it dry a little bit up. I tossed like 5 times in the autumnn, but since the pile did not heat up again, i stopped. I would say yes, it was half and half, because i mixed straw with horse manure, and layered it with the rest of green stuff. I also added a lot of wet but brown leaves to that mix. Hi there. 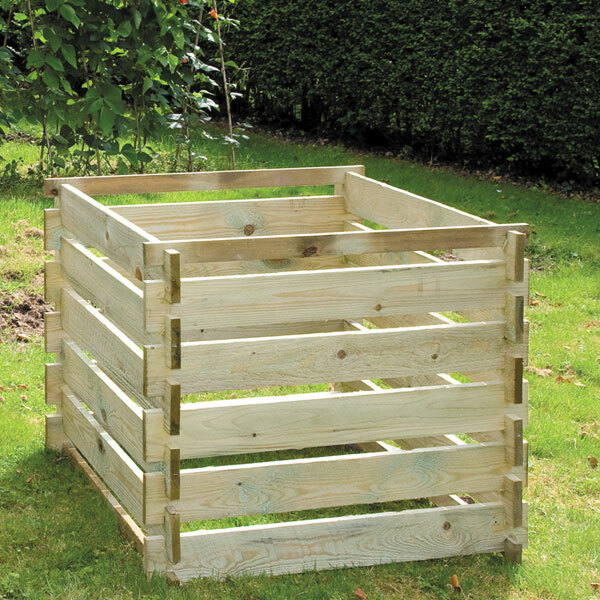 I build the bin form a Danish recepie - if the space between the slats are as large as your picture, i can imagine that there will come a lot of rain into the compost and make it really wet? Maybe i should take a 2 inch pipe and drill a lot of holes in it, and dig it all the way down into the middle of the compost? I have build a lid today, to keep rain from coming in. Yes the front of both bins can slide out. I only put the compost in both bins to help it dry, normally i use the other bin for turning. This weekend i gatheret 3 large bags of really dry leaves, do you suggest i mix it up with those? Should iput it in layers, or grind it around with a whipper? If i take some compost and squeeze it real good, small drops of water will come out.. And yes, it looks really compacted. It is really heavy aswell. Compost piles started in the fall are usually cold composts. Remember that the soil and composting organisms do slow down in cooler weather and are more active in warm weather. Fall composts are allowed to rot over winter and is ready about 5-6 months later. I think even though you turned it 5 times, it didn't get fluffed and mixed enough and it got too much water. It should only be as damp as a wrung out sponge, if you could squeeze water out of it, then it was too wet. Here we would but a tarp over the pile if it rains too much to help keep it from getting too much water. Also when you add things like grass, it is important to break it up and not add a clump of it. It will tend to mat, hold on to water, not let air through and smell really bad. Normally a compost pile only smells when it goes anaerobic. It's usually caused by adding too much green or too much water. It will still rot but it takes longer. I am assuming it is wet throughout and not just in areas where there is a heavy accumulation of greens. There should be no smell if it's fully composted. As tomc says, you can go ahead and put it out if you feel it has finished. If it isn't finished soil bacteria will continue to work on it and consume nitrogen as they do. You'll get it back when they die but you may have to add nitrogen to the soil to compensate for the temporary loss. I do it all the time. I agree with Rainbow, it's too late in the game to add sawdust. First dry it out like imafan26 suggested. Then toss to aerate. After a couple of days, if the smell doesn't go away, there are probably too many greens in the pile and you should add brown leaves. Did you count the horse manure as a brown or green? It's a potent green and it is easy to underestimate how much you're adding when it's mixed with straw. If the smell goes away and it doesn't heat up, but you still want to try cooking it off, mix in some more horse manure. If that doesn't heat it up it's probably done as much it will. You can either let it age a few months (because of adding manure that wasn't aged) then use it or add it a little at a time to your new pile. I see by the color of your grass and bushes that it's warm enough to for a proper pile to start cooking. Good luck and please let us know how this comes out.